Thanks to everyone for your notes of concern. After three days without heat and two without any power at all, we finally got our electricity turned on at 8:00 last night–just in time to save our tropical fish, who were not looking so good. Getting the electrical panel fixed wasn’t a problem, but dealing with the overworked building permit office and the bureaucracy-bound power company was a nightmare. It took a day and a half after everything was fixed to get them to come out and turn the power back on. The whole ordeal is almost enough to make me want to run away to the woods and build my own solar power generator. Fortunately, in the days leading up to our power outage I was able to get a little cooking done. On Sunday morning, I made these fluffy, lightly spiced pancakes, based on the Basic Pancakes recipe in Bryanna Clark Grogan’s The (Almost) No Fat Cookbook. Someone recently asked in the comments if there were any fat-free vegan cookbooks, and the answer is a resounding Yes. For years, (Almost) No Fat and another Bryanna book, 20 Minutes to Dinner, were my fat-free bibles. Her recipes have just the right balance of healthiness and deliciousness, something mine can only aspire to. As far as I’m concerned, she will always be the queen of low-fat vegan cooking. For these pancakes, I’ve added freshly grated orange peel to ramp up the fresh orange taste and spiced the batter lightly with cinnamon, nutmeg, and cloves. I prefer the spice to be just an accent to the orange, not overwhelming, so if you want really spicy pancakes, you’ll have to add more. Begin heating a non-stick frying pan over medium-high heat. Meanwhile, mix all the dry ingredients (flours through cloves) and add the rind, juice, and raisins to a well in the center. Mix briefly, just until combined (a few lumps are okay). When the skillet is hot, drop the batter by quarter-cupfuls and cook until the tops are beginning to bubble. Turn and cook a couple more minutes until the underside is golden and the inside is cooked. Serve immediately. Without raisins: 109 Calories (kcal); trace Total Fat; (2% calories from fat); 4g Protein; 24g Carbohydrate; 0mg Cholesterol; 268mg Sodium; 2g Fiber. Previous Post: « Happy New Year! Although I too had to use more orange juice this is by far the best pancake recipe I've ever made or tasted! Thanks for another great one. can some one enlighten me – what is the difference between baking soda which i have and baking powder – what is in this? Baking powder contains baking soda and cream of tartar. It is premixed with an acid so it reacts to a liquid. Baking soda would need an acidic element in the recipe to react to. In this case, the orange juice. Basically, baking powder contains baking soda plus an acid ingredient that causes rising to happen. Baking soda needs to be exposed to an acid in order to cause leavening. ah! so that is why my cakes dont rise so much – but if u put vinegar is that enough of an acid to not need the baking powder? and also cna u pls tell me if i am doing vegan why do my cakes turn out to be really rumbling as in they fall apart – dont hold? i dont like using margerine so i am using just sunflower oil? any advise? Eating these as I type, and enjoying them VERY much. They are absolutely amazing- my new favorite pancake from your site 🙂 Thanks for all the great recipes. I also added a few spoonfuls of sugar to the recipe to make it sweeter, and served it with raw agave nectar on side. These look wonderful! Going to try them for dinner tonight! Thank you so much for the wonderful recipe’s you post. I am newly vegan and have been using your site religiously since the new year. I just wanna say, these aren’t just great vegan pancakes, they are the best pancakes I’ve ever had, vegan or not. Thanks for everything Susan. is the type of flour you need really important? i have whole wheat and white flour so cannot I just use those? The flours I specified will make a slightly lighter pancake, but whole wheat and white flour will also work. Making the golden spice pancakes and the batter is incredibly thick! Are you sure you only use 1 1/2 cups OJ? I just became a vegan last week and I a excited to try a lot of your recipes! If it’s too thick, definitely add more OJ. Flours can have more or less moisture, so sometimes you have to play it by ear. Congrats on becoming vegan! I wonder, do you really need two kinds of flour or is one enough? Thank you! I can’t wait to try these and the oatmeal cookies! The white flour just lightens them up. If you don’t mind a heavier pancake, you an use all whole wheat flour; if you don’t mind a less nutritious pancake, you can use all white flour. 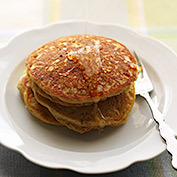 Can I make the “Golden Spice pancakes” using only whole wheat flour? Yes, but you will probably need to use a little more orange juice if the batter is too thick. Made them this morning. The perfect sunday morning breakfast, they were fantastic, especially with a chocolate spread on them! Thanks for all the wonderful recipes. I can’t imagine how 1.5 cups of OJ can be all the liquid you need to make this recipe into a pancake batter, there has to be a typo in there somewhere. I didn’t have any extra OJ so I added 0.75cup of soy milk and they turned out great. I’ve put them in zip lock bags and hope to re-heat them in the toaster and eat them with honey or jam or something like that. These pancakes were very yummy, but my batter came out very thick, so will adjust liquid next time. My husband, who has no desire to be vegan, really like this recipe, so will be making it again. Thanks for sharing! I am definitely excited to make these pancakes but a little nervous too. 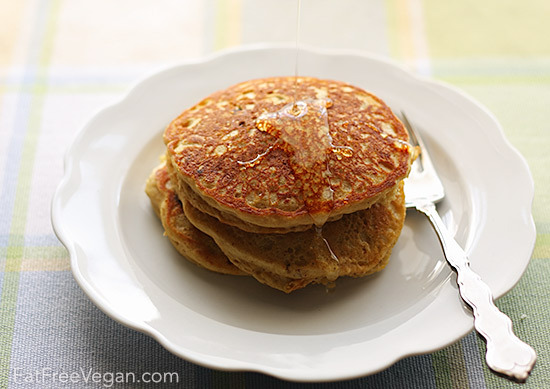 Most of the time when I make vegan pancakes they don’t seem to cook all the way in the middle, no matter how long I cook them. Do you know what my problem could be? Maybe your batter is a little too thick. Try adding a little more liquid than the recipe calls for. Often, my batter seems to thicken as it sits, so I add water as needed. I have all this different kinds of flour such as Almond Flour and other wheat free flour ,can that be used up with some of your receipe, such as Pancake ,you see I have started a wheat free and Gluten free products diet and would like to know if I could use it up .I would hate to throw it out ,it cost allot of money .Help. Forgot to mention that Iam a Diabetic type@ 2000mg of metformin each day. and overweight by 60 lbs .Can I use stevia for sugar sub. I’ve never used almond flour, so I can’t say how it will work in this recipe. I know that most gluten-free baked goods are made with a blend of flours–you need some that are starchy and some that have more protein and sometimes also a thickener. I recommend you do a search for baking blends using almond flour to find some good recipes. My Bill & I both LOVE these pancakes. They are YUMBO! !